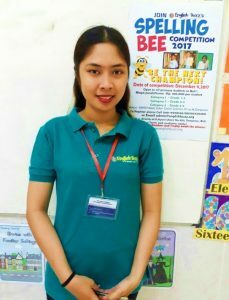 I am Ms. Naomie K. Lastra and presently working as the Academic Consultant, Curriculum Developer, ESL teacher and trainer of English Buzz. 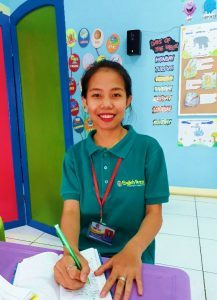 I have more than 10 years of solid teaching experience here in the Philippines and Indonesia, where I work closely with young learners ages 5 to 16 years old in the mainstream education (national and international schools), and teach Adults for ESL lessons. I’m a certified teacher and trainer and a graduate of Communications and Education degrees. I am willing to share my expertise to Indonesian and international students of all ages and help them achieve their personal and academic goals. I am originally from Manila, Philippines but I love Bali so much that I decided to make this my home. I am a lifelong learner so when I am not working, I read a lot, write journals and go ‘jalan-jalan’ in many places abroad. 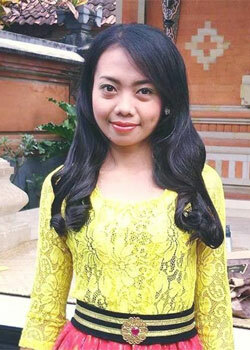 I am Miss Kusuma, a native of Bali born on 25th of December 1991. I grew up in Mengwi, Badung Regency. 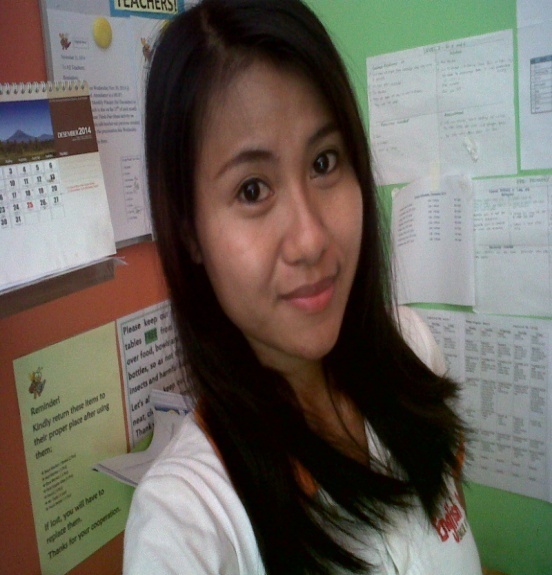 I studied and received my Bachelor’s Degree in English from Mahasaraswati University Denpasar last March 2014. My very first teaching experience after finishing college was teaching English to private students for two years and joined an English language school for six months. And last July 2014, I joined English Buzz to expand and grow in my profession as I get to meet international students. I am currently teaching students in all year levels. We are a creative team and we inspire students to learn different languages using different methods in an enjoyable way. Currently, I am the Team Leader of the English Buzz family. I am Elsi Surya Priyanti, and call me Elsi for short. 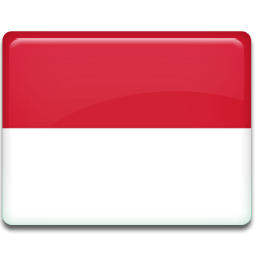 My family is originally from the city of Denpasar, Bali. I graduated from STIBA Saraswati Denpasar last year and got my Bachelor’s Degree in English Literature. 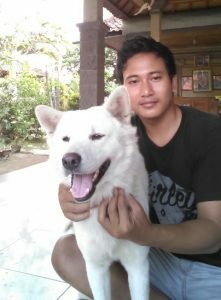 Previously, I taught English in a language school in Denpasar and volunteered to teach English to less fortunate children at Yayasan Bhakti Senang Hati in Gianyar and also at a local school in Tabanan Regency. As for my hobbies, I listen to music of any genre, all the time. I also like to cook, watch Korean-drama series during my spare time and hang out with my friends during the weekend. I joined English Buzz this year and currently, I teach English and Bahasa Indonesia lessons to students in all levels from young learners to adults (business/cruise line/foreigners). I’m so glad that I have become a part of this wonderful family this year. I learn a lot each day from my co-teachers, friends and students, not only from the professional side but also personal lessons in life. The students are all sweet, talented and amazing too. I will always treasure all the memories I’ve been sharing with my EB family since I started working at this school. My name is Wayan Adi Wiweka or Mr. Adi for short. I’m an English teacher, grapic designer and also a painter. I was born on December 26, 1991 and live in Badung, Bali. I graduated from Undiksha University in Singaraja, Bali major in English language. I’m an English teacher at English Buzz teaching grade school and middle school students. I also teach at a vocational high school (SMK) in Gianyar. I’m a creative person so aside from teaching, I own a convection business, which means I design and produce t-shirts and other types of clothing materials. Probably the T-shirt that you are wearing right now might be one of those I’ve made in my shop. As a hobby, I like dogs very much but no so much on cats. 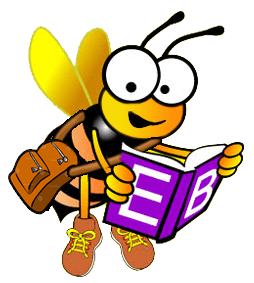 Hope to see you at Ebuzz and learn more about your English teacher. My name is Ester Dwi Astuti or call me Ester for short, not Dwi or Astuti and I’m 23 years old. I graduated from Udayana University Faculty of Letters major in English Literature last December 2016. I might be new in the teaching profession, but I got a strong passion in teaching English to young learners, and I want to show my best effort in my work. Presently, I teach Preschoolers (TK), Level 1, 2, 3 also known at our school as our primary students, high school, and cruise line students as well. Here at English Buzz, I found a loving family and I’m so happy to be around my lovely colleagues and students. We joke and laugh a lot together, and learn life’s lessons from one another and we complement each other very well in this place. I really enjoy working here and I’m happy where I am in my life at this time because I know Jesus gave all this blessings for me. I am Rai Sumiati from Badung, Bali. 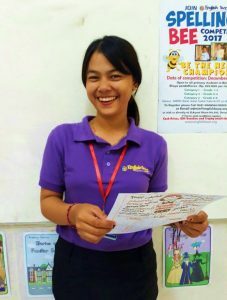 I’m a certified teacher and graduated from Mahasaraswati University -Denpasar in 2013. 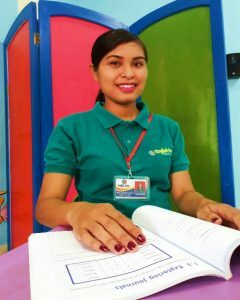 I have been teaching English for the last 3 years and currently an English Teacher at Ebuzz teaching all grade levels. I am also energetic, fun and a cheerful educator. I could manage the classroom situation well. Teaching is my passion and it is my main job. I love children very much and I can be patient when handling different students’ behavior and characters. For me, in teaching I can share my skills by transferring knowledge to my students in the easiest ways for them to understand and communicate in the language at the same time have fun while learning English. I love teaching, it’s my life. 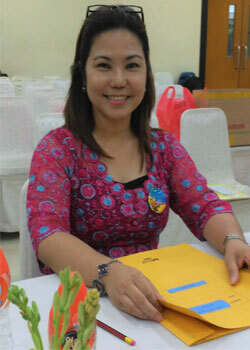 My name is Maria Adudes Seran, and my students fondly call me Miss Ides. I am originally from Kupang and I was born on February 25, 1993 in the East Timor side. I am proud to belong to the 2016 batch of the graduates of STIBA Saraswati Denpasar. 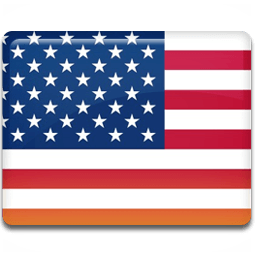 Here at English Buzz, I teach English to students ages 5 to 16. I enjoy using holistic methods to my students and I see them progress in their language skills slowly but surely. I also teach Bahasa Indonesia for foreigners from beginners to advanced learners. My students mostly come from Italy, USA and other countries, and I find it a joy to exchange information about their cultures and traditions with that of Bali and Indonesia. Teaching is one of my ideal job. My hobby includes listening to music and watching movies with my family during my day offs. I love teaching children so I always try my best to make my students happy by making them meet their personal goal which is to learn either English or Bahasa Indonesia. This is your fun and dynamic teacher, Ni Kadek Indah Pratiwi. Everyone at school calls me Miss Indah but at home they call me Kadek – which in Balinese language means the second child in the family. I previously completed a course in Hotel/Hospitality field but I decided to follow my calling and pursue my dream job which is teaching. At the moment, I am finishing my Bachelor’s Degree in Education at Mahasaraswati University and I am at my sophomore year. I started teaching at this English Buzz early this year and I can say that I really enjoy teaching super cute students ages 4-7 years old and it’s a delight to see them talk and read English in class. I have also gained a lot of teacher friends at school who make working fun and they also help me become a good educator, and a strong-willed person too. I always strive to be the best teacher I can be and also a good member of this EB family.